I have a very good friend …..let’s call her P. I love her. She is one of those rare people that you meet…….a person without a personal agenda. Her worldview is rooted in a deep sense of family, friends and place. She understands people by their actions, and only by their actions; she reserves judgement because circumstances alter cases. She understands people… never by who or what they are; never by what they have; never by what they can do for her. She measures things not by how much they cost or are worth in euro signs but in the differences they make and the effects that they have on the people she loves. As I said, she is a rare individual. I write this today because she is heartbroken, and if she is heartbroken, something is wrong, because she is the rare one among us who sees the good in everyone and everything. It may seem trite and unimportant to some, but she is heartbroken because of a bridge….a piece of engineering…a structure of concrete and steel, like countless others throughout the world. Her heart breaks because of where it is…..because of what it means………because of how it has come to this point….because of the how it will shape the place that she loves…because of how it will effect the future of the people and place that she loves. She is quintessentially a kind and generous person; the gentlest of creatures, confrontation and protest are alien to her nature. Yet during this last summer, she walked at Green’s bridge in Kilkenny. In her quiet way she strolled, and stood, and cried as numerous Gardai approached….as some of them whom she knew, in a previous life, as friends kneed her into her back and corralled her, tried to make her feel powerless……..to make her and others feel as if she were wrong to be there…..wrong to care about the future of those and the place that she loves. At that time of standing up, the council maintained that this bridge, this feat of engineering, was necessary to address traffic congestion in the city. But P saw this structure not as the relief of congestion but instead as a nightmare of thousands of HGV’s rocking the foundations of all she loves and holds dear. Later the council maintained that the bridge was necessary for pedestrians and cyclists….but this fundamentally honest woman was never convinced……to her these arguments didn’t hold up. Why build a bridge this size for cyclists and pedestrians she asked…it didn’t make sense? Last week-end in Kilkenny a group of internationally renowned, professionally respected economists and expert commentators on development, could not between them, find even one argument in favour of this bridge. Today I hear a council representative on the radio maintain that this bridge is necessary to ‘open up’ both the Mart and Brewery sites for development. Today’s radio revelation has not been what has been said up until now…..until now CAS, as its name suggests, has been about traffic, a narrow Greensbridge and lately cyclists…..but perhaps today, it was deemed safe to finally admit what the project has been about from the outset….. now that the ownership of the Mart site has been decided. The Mart site is now privately owned….the proposal for the Brewery site is to lease it to private companies…..so finally it is clear. 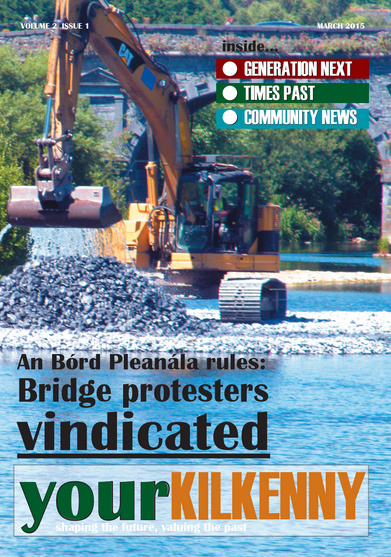 Kilkenny County Council are building a bridge, and the people of Kilkenny will pay for it… and as a result privately owned companies, and perhaps individuals, will grow their property balance sheet overnight…..and shape this city according to their profit and loss accounts…..and throw a few jobs in, if necessary for as long as agreed in the terms of the lease or planning permission, or at least for as long as it suits. 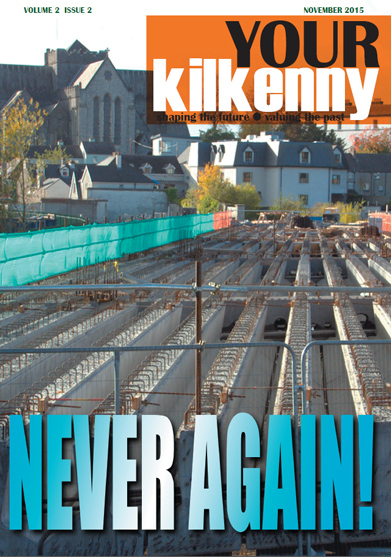 But at what price to us…..the people of Kilkenny…the businesses of Kilkenny….the unique character and soul of Kilkenny…past , present and future? Well we will have a concrete structure to look at, for as long as it lasts……but is this enough….is it all……have we even agreed to it? My honest, unassuming and gentle friend P says that she has never has. I believe her. And yet today the street is closed and work ploughs on…..and she is heartbroken……and so I write this, because somebody ought to. A Summer of protesting, what does it mean? It surprises me that I never get asked by friends and family. Maybe I have been too quiet about it. You see to protest, which I have never done before, is something your heart drags you into. You can no longer sit back and complain, you know something is wrong and it’s time to do something about it. It’s not easy leave your comfort zone. I have always believed in right and wrong – try to see the good in people. You all know I love Kilkenny and am a very proud Kilkenny woman. That is why I could not sit back and do nothing. I believe what is happening in Kilkenny is wrong. I have not seen one argument to convince otherwise . I have educated myself on facts not the fiction or spin that Kilkenny Co Council have put out there. They have pulled figures out of air as to what protesting has cost tax payers and never been able to back these up. The reality is protesting had very little to do with any delays on this job. We might have held things up slightly on a daily basis for a while. But the Gardai came and pushed us aside all deliveries went in. The contract was signed in a hurry to get work started in the hope no one was watching. They knew work would not be finished and they would be back again next summer. Those of you who know me, know I am not a dishonest person. I would not knowingly lie, so please think before you believe the spin that has been put out there. I have protested for my family and for my Dad. It is one of the hardest things I have ever done. It is also one of the things I am most proud of. I have never known such a sense of community in Kilkenny before .Thank you all who have walked with me and roll on the hearing in October. 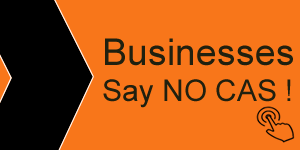 Citizens engaging with The CAS protest have been vilified, firstly for being ‘lazy’, ‘didn’t engage’, ‘didn’t care’ …..blithely sidestepping the fact that this CAS project, in different guises, has been on Co. Development Plans since the 70s, and never came to fruition, due in no small part to the level of ‘public engagement’ from ‘lazy’ people. Now when citizens actively engage as our government encourages ‘active citizens’ to do, these same citizens are further vilified…..for being too loud…they are not a majority…..it seems you can only be a majority when you are silent! These citizens have been vilified for being undemocratic because they dare to to raise their heads above the parapet and ask that democracy be seen to be done, in the Council Chamber. These citizens, ordinary people from all walks of life, in Kilkenny city, have been vilified because they dare to question and undermine the ever-changing rationales offered to drive this project on. These ordinary people have been constructed and policed as criminals because they dared to attempt to slow down work on a project, signed off on before the their newly representatives had an opportunity to raise the voices of the people in the council chamber. What would the outcome of such a debate have been had it taken place before the contract was signed, the state of play that existed at election time? We will never know because it never happened. The unelected Council Executive made an Executive decision to ensure it could not happen. And yet it is the ordinary people, the citizens who are vilified and criminalised!! If this campaign has in fact generated any real additional costs, in and of itself alone, it is again down to the choice of the Executive, to sideline the democratic process. The most recent attempt at marginalisation, that all of the ordinary people involved in this campaign are represented by Green Party, Sinn Fein and Independent councillors only, thus the call to these elected members and only these elected members to intercede. What this particular and unsubtle attempt at marginalisation attempts to do is to imply, that only fringe minorities are involved in this campaign. What an insult to the citizenry! Nothing could be further from the truth. The majority of the ordinary citizens involved, in this democratically driven campaign, are Fianna Fail and Fine Gael supporters and voters. Whether they will continue to be so in the future is however another question. What is in fact true here is that some individual councillors choose to enshrine their own individual views on this project as fact, rather than the views of those who elect them. Those involved in this campaign have been vilified at all levels, except where it matters most, on the streets, with the people, whose encouragement, support and ‘thank you for what you are doing’, gives the campaign the legitimacy and energy to continue. In recent days, last Monday’s vote on a ‘technicality’ has been mediated, in some quarters as a vote on the CAS project itself. This is untrue. There has still been no democratic engagement in the chamber on this issue, in the lifetime of this council. However, Monday’s vote seems to have given license to the private security company at the site, to act with impunity. This is unacceptable in any democracy. If as the Executive claim, that they are paying this force, then they are directly responsible for employing a private army, to silence this campaign. Is this what democracy in Kilkenny has come to? It really is time for all elected members and the Executive to engage with the citizenry. It should have happened a long time ago.